The 1989 Tour de France was decided in the last stage, a 15.2 mile time trial into Paris. 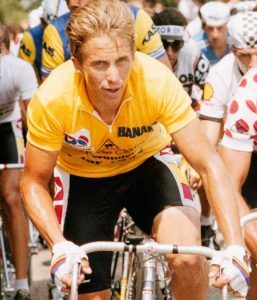 The leader, Laurent Fignon, held a fifty second advantage over Greg LeMond. Both riders were strong time trialers. To make up fifty seconds in such a short race seemed impossible. Most observers assumed that Fignon would hold his lead and win the overall title. In most time trials, coaches radio the riders to inform them of their speed, splits, and competitive position. In this final time trial, however, LeMond turned off his radio. He didn’t want to know. He feared that, if he knew too much, he might ease up. Instead, he raced flat out for the entire distance, averaging 33.9 miles per hour, a record at the time. In a stunning finish, LeMond gained 58 seconds on Fignon and won the race by a scant eight seconds. (Here’s a terrific video recap of the final stage). LeMond’s strategy is today known as information avoidance. He chose not to accept information that he knew was freely available to him. LeMond knew that he might be distracted by the information. He chose instead to focus solely on his own performance – the only variable that he could control. While information avoidance worked for LeMond, the strategy often yields suboptimal outcomes. We choose not to know something and the not knowing creates health hazards, financial obstacles, and a series of unfortunate events. Here are some examples. In a study of 7,000 employees at a large non-profit organization, Giulio Zanella and Ritesh Banerjee found that women are less likely to get a mammogram when one of their co-workers is diagnosed with breast cancer. The mammogram rate dropped by approximately eight percent and the effect lasted for at least two years. (Click here). Amanda Ganguly and Josh Tasoff offered students tests to determine if they carried the herpes simplex virus. Though the tests were free and readily available, about five percent of the students refused the test for the HSV1 form of the virus. Fifteen percent refused the test for the HSV2 form of the virus, which is widely regarded as the “nastier” version. In other words, the scarier the disease, the more likely people are to avoid information about it. (Click here). Marianne Andries and Valentin Haddad investigated similar effects in financial decisions. They found that “…information averse investors observe the value of their portfolios infrequently; inattention is more pronounced …in periods of low or volatile stock prices.” Again, the scarier the situation, the less likely people are to search for information about it. (Click here). Russell Golman, David Hagmann, and George Loewenstein also investigated economic decision making and identified five information avoidance techniques: 1) physical avoidance; 2) inattention; 3) biased interpretation; 4) forgetting; 5) self-handicapping. (Click here). Focus and fatalism – why learn something that we can do nothing about? I suspect that this was LeMond’s motivation. He couldn’t do anything about the information, so why receive it? Instead he focused on what he could do. Anxiety – why learn something that will simply make us anxious? The scarier it is, the more anxious we’ll be. We’ve all put off visits to the doctor because we just don’t want to know. Ego threat – why learn something that will shake our confidence in our own abilities? It seems, for instance, that poor teachers are less likely to pay attention to student evaluations than are good teachers. Information avoidance can also teach us about persuasion. If we want to persuade people to change their opinion about something, making it scarier is probably self-defeating. People will be more likely to avoid the information rather than seeking it out. Similarly, bombarding people with more and more information is likely to be counter-productive. People under bombardment become defensive rather than open-minded. As Aristotle noted, persuasion consists of three facets: 1) ethos (credibility); 2) pathos (emotional connection); 3) logos (logic and information). Today, we often seek to persuade with logos – information and logic. But Aristotle taught that logos is the least persuasive facet. We typically use logos to justify a decision rather than to make a decision. Ethos and pathos are much more influential in making the decision. The recent research on information avoidance suggests that we’ll persuade more people with ethos and pathos than we ever will with logos. Aristotle was right. Greg LeMond’s example shows that information avoidance can provide important benefits. But, as we develop our communication strategies, let’s keep the downsides in mind. We need to package our arguments in ways that will reduce information avoidance and lead to a healthier exchange of ideas.